An upbeat used car market: When will the tipping point be? As we hit mid-March we appear to be at one of those “watershed” moments for the used car market. Since the turn of the year, the situation has been a buoyant one, with volumes higher than 12 months previous but matched by healthy demand. Whilst the number of cars for sale has not been an issue, the quality has, so buyers battling for those prime nuggets in CAP Clean condition have had competition from other potential buyers which has stopped prices, overall, from falling. The early part of March has been no exception to the previous two months and, in general, most car ranges values have not fluctuated by much, if at all. 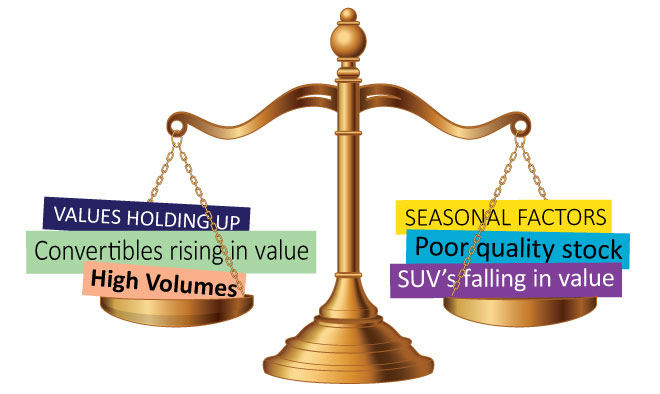 Exceptions as always are in those seasonal vehicle sectors – convertibles are rising in value and larger SUVs are generally falling. So why a watershed? Volumes in the marketplace are now rising steadily, due to new car activity in the March new-plate month. Whilst manufacturers seek to maximise their performance during the first month of the “15” plate going on sale, this then generates both retail part-exchanges and fleet returns. Additional volumes in the used car marketplace need to be matched by demand from retailers and consumers. Traditionally, demand from the latter tends to drop away post-Easter. It remains to be seen whether a tipping point is reached during March or in the early part of April. It does seem to be a case of when rather than if though. Having said that, a dip in values around April is a normal seasonal occurrence, and no cause for alarm. Depreciation is very unlikely to be at a level higher than that already forecasted by CAP. Derren manages the valuation process for current used car values at CAP, which includes managing a team of 7 Black Book Editors who analyse around 120,000 individual sold trade records each month from a wide variety of industry sources. Derren and the team also engage in market insight discussions with various auctions, leasing and rental and remarketing companies and vehicle manufacturers throughout the month. The Black Book Team has around 200 years’ experience working in the automotive industry.